Submitted 4 months 3 weeks ago by Victoria Hume. 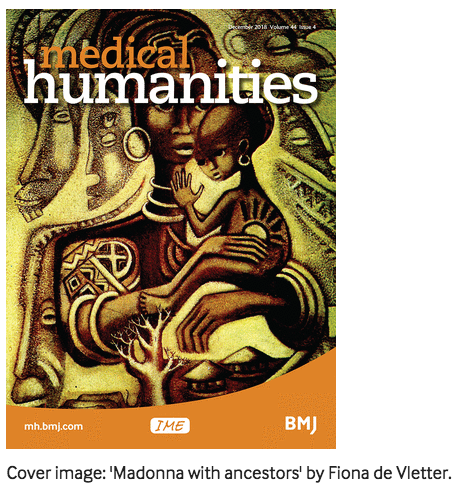 The BMJ’s Medical Humanities Journal has just published the first English-language special issue to deal exclusively with work on and about Medical and Health Humanities (MHH) in Africa. Edited by Carla Tsampiras (UCT), Nolwazi Mkhwanazi (WiSER) and Victoria Hume (WiSER), the special issue is showcasing the work of new and established academics and practitioners working in the field in the December 2018 special issue – with an accompanying series of blogs and podcasts. ​The special issue is an initative of the Medical and Health Humanities Network Africa - a collaboration between universities and individual practitioners across Africa, and was developed at a WiSER workshop, co-funded by the University of Cape Town, with participants from South Africa, Zimbabwe, Kenya, Nigeria, Tanzania, Malawi, Swaziland, the UK and Canada.